Hi can anybody recommend any where to get a full respray in the North East of England apart from wizard paint shop click here, im willing to travel if there is proof of previous jobs. What prices have you got so far ? I was quoted £1400 for a full respray. How come you need a full respray fella ? I haven't got any quotes yet still waiting for one guy to get back to me. Reason I want to get a respray is I want to change the colour of the car and there is signs of rust above both rear wheel arches the size of a 20p coin that the previous own has tried to paint over. 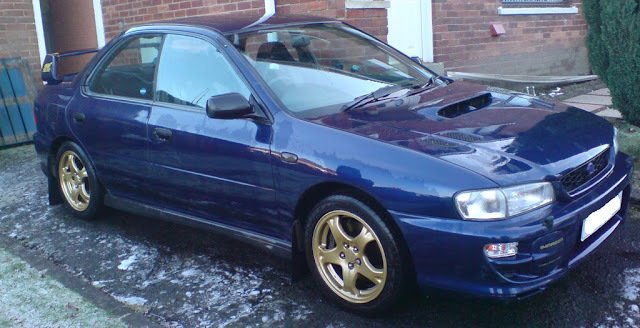 At the minute its silver and only black goes with it and I don't like the after market wheels that are fitted click here, i know this sounds a bit daft but i preferred the original Subaru 16" alloys on my old car as pictured below. The car I have now looks smart from a distance but close up the wheels are too revealing if you know what I mean. Im thinking of getting it painted black or Mica Blue like my old car. The other reason i dont like the alloy wheels is the ride comfort has gone. There is a few small problems with the car, front wheels need re-balancing its not that bad just a very slight vibration. Near side rear brake disc is warped. Colour change is a big job if you're going to do it properly, what colour was you thinking ? There's a shop local to me, TD Respray, I popped in there and had a look at some of their work. I was thinking black or mica blue. I like what your doing to your wagon, cant wait to see it finished. Hi, the wheels in the photo are Subaru's 16". Im after 16" as I have 17" ones on at the minute and the ride is on the harsh side. I can do a colour change no problems, Im doing mine aston martin pearl white with some HOK IP04 violet pearl in laquer, if your in no rush check mine out before you decide il let you know when its done. Im in no rush, I'll definitely check your work out, as im left almost broke after my accident. The insurance company im with Highway Insurance part of LV told me when I get the cheque that it was for a like for like car so they would just swap the details straight over. So I get an almost identical MY99 model, called them up and then they demanded £631 upfront (I even protected my 5 years ncb). So the insurance is getting sorted tomorrow, then next wage packet will be to get the rear brakes done as one side has a warped disc and both pads are low. Then I can start saving for the respray. if u just want the outside done mate price wise your looking at 1200-1500 but for shuts etc its a much bigger job. looking around 2200-2500. hope that helps.